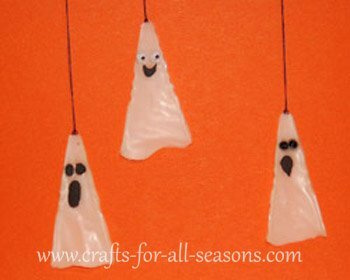 This spooky ghost necklace is very fun and easy to make. It is easy enough for children to do and they will love to wear these necklaces to school on Halloween. 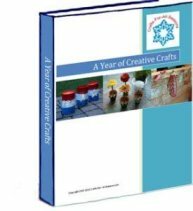 Or, several can be made and they can be made into a small mobile. I even saw someone make these into cute dangling earrings once! They are the simplest thing ever... they are just made out of regular white school glue! A hairpin gives the glue the proper shape while drying. They either dry somewhat clear or a light washed out white. Enjoy! 1. Open up each hairpin slightly to make it the size of the ghost you want. Or, straigten out a paper clip and bend into a V shape. 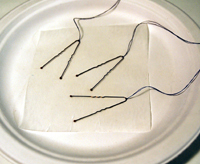 Tie the black thread on the top of each hairpin, long enough to make a necklace. 2. Cut a small of wax paper and rest it in a paper plate. Make sure the entire surface is flat, so the glue will not run. 3. Cut out some small eyes and a mouth from the black construction paper, or use googly eyes or seed beeds. 4. Add the white glue inside the hairpin to form the ghost’s body. Fill in any gaps so the glue completely touches the hairpin all around. 5. Place the eyes and mouth in the glue to make a face. 6. Allow to dry overnight. 7. When completely dry, slowly peel up the ghost from the wax paper. Use the scissors to trim off any of the excess glue that might have crept around the edges. Very carefully peel away the paperclip or the hairpin, and slide it off through the thread knot. Your thread will still be attached since the glue dried on it where it was tied. Your ghost is now ready for wearing.